Smart marketers are getting more skillful at content strategies that understand customer intent and then target content accordingly. 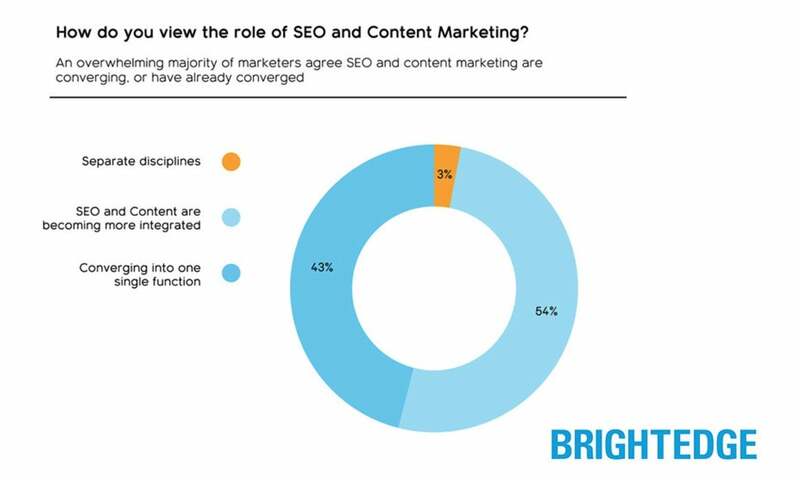 In the aforementioned survey, 97 percent of respondents agree SEO and content marketing are converging, or have already converged. The same survey found organic search is the number one priority -- a smart focus considering organic drives 51 percent of all website traffic. Effective use of these strategies demands some deep thinking about the steps consumers take during their purchase-making decisions -- and the words that are likely to move them at each stage of their journey. Otherwise, effort and resources will be lost on content that is inaccessible. When a consumer searches for “Tahoe” today, he might want a Chevrolet SUV or a winter ski vacation. AI puts that search into the context of the user’s past searches -- pickups or snowboards -- and makes some educated guesses about the user’s intentions. Searches conducted from mobile devices, of course, provide even richer context -- and not just information about the user’s location. Savvy marketers gain an advantage from their knowledge of the speed at which a mobile device is traveling or the types of apps that are installed on the phone. The rapid arrival of voice search further upends existing strategies. Gartner estimates that 30 percent of web browsing will be screenless within the next couple of years. That demands strategies that are different from today’s type-in-the-box search. The convergence of these powerful trends, however, finds many marketers -- even at big brands and big agencies -- unprepared. The research by BrightEdge found that most of the 252 big-company and big-agency marketers it surveyed acknowledge that AI, voice and hyperlocal search have arrived. But the majority of the marketing professionals surveyed don’t plan to adapt their marketing strategies in response. Read that again: A big wave of change is about to roll over digital marketing, and the majority of marketers willfully stick their heads in the sand. 30 percent of the digital marketers surveyed believe that voice search is the next big thing. That’s a reasonable assumption, given the rapid adoption of voice search that’s clearly underway. 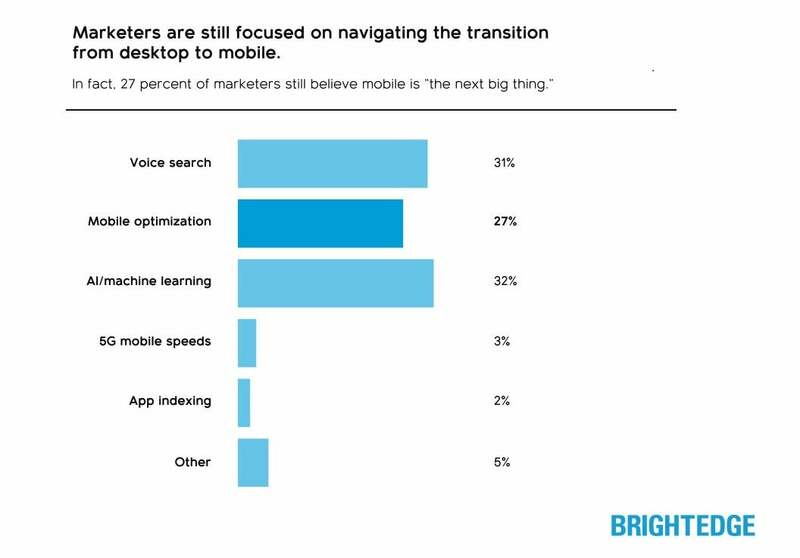 But even though they expect that voice search is coming in a big way, two-thirds of the digital marketers say they don’t have plans to prepare for the arrival of voice search. Another 32 percent of survey respondents believe AI is the next big thing, yet 57 percent of them aren’t doing anything this year to get ready. Only three percent of respondents said they anticipate 5G mobile speeds being the next big thing, but according to recent reports, this is projected to be a reality by 2020. Dig a little deeper into the BrightEdge survey and the worries arise again and again. More than a quarter of the marketers surveyed believe that mobile is “the next big thing.” Mobile is a big deal, but it’s already arrived. It’s nobody’s idea of a new-horizon technology. Jim Yu, the CEO of BrightEge, cautions that the disconnect between the understanding and the actions of digital marketing professionals leaves brands at risk of failure to meet the rising expectations of consumers. Marketers don't need to be taking giant leaps forward. One-step-at-a-time tactics will work. For instance, Michel Kant, the SEO manager of Staples Europe, noted in an email interview about the BrightEdge survey that the rise of AI in search puts a premium on consistent messaging across devices, and that’s work that can begin right now. Brands that don’t begin taking the first steps, however, will find themselves in a costly, frustrating footrace to catch up later on. The old maxim known as Noah’s Law reminds us, “Predicting rain doesn’t count; building the ark does.” It looks like it’s time for the digital marketers who are good at predicting rain to get to work on that ark.